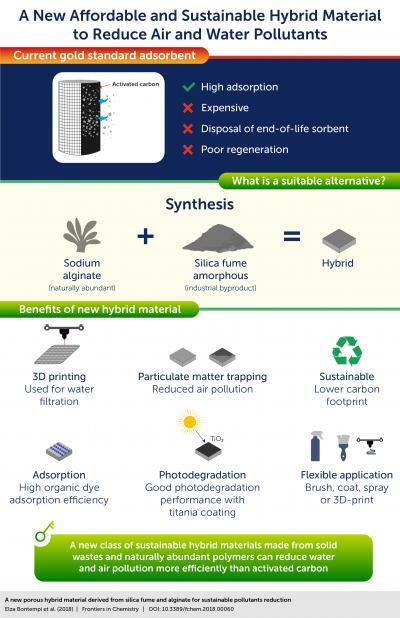 A new class of low-cost and sustainable hybrid materials could possibly displace activated carbon as the preferred choice for reducing wastewater and air pollution. The material, described in Frontiers in Chemistry, is synthesized inexpensively from solid wastes and a naturally abundant polymer — and can cut down pollutants in air and wastewater with more success than activated carbon, the current gold standard adsorbent. Particulate matter — solid particles and liquid droplets found in the air and emitted from power plants, industry, automobiles and fires — is ubiquitous in cities and even the countryside. Moreover, millions of tons of industrial effluents are released into the world's waters every year. Both particulate matter and organic dyes are highly toxic to ecosystems and to humanity. Activated carbon is the most common adsorbent used to reduce both atmospheric and wastewater pollution — but is expensive to produce and regenerate. The challenge has been to find an economical alternative.